With its wide f/2.8 constant aperture, this superb high-speed wide-angle-to-medium-telephoto (26-78mm equivalent) zoom lets you create natural-looking pictures in almost any light, or capture faster-moving subjects. One of the most compact and lightweight lenses in its class, its shallow depth of field at wide apertures allows you to create dramatic pictorial and portrait effects by softening background details so the subject looks more vibrant and three-dimensional. 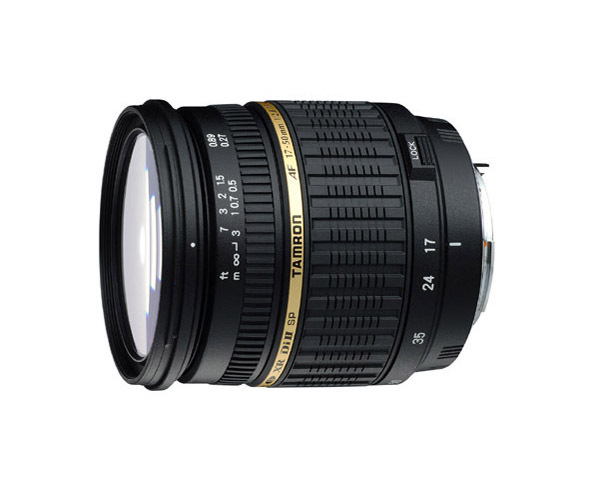 The 17mm focal length (26mm equivalent) provides a wider angle of view than ordinary standard zooms, while maintaining the lightweight and compact size. The minimum focus distance of 0.27m over the entire zoom range achieves a maximum magnification ratio of 1:4.5 at 50mm. The lens boasts one of the best close-up shooting performances in its class*. *Being standard zoom lenses for DSLRs, featuring a constant f/2.8 maximum aperture. By employing internal surface coatings (i.e., multiple-layer coatings on cemented surfaces of plural elements) and new multiple-layer coating technology on ordinary elements, ghosting and flare due to the reflections that occur when light enters through the front element and reflections caused by the image sensors themselves are reduced to the absolute minimum. Exclusive design for digital SLR cameras achieves a fast standard zoom lens that covers virtually the same angles as focal lengths of 26-78mm when converted to a 35mm format. The wide-angle focal length is established at 17mm (26mm equivalent) to obtain a wider angle of view than ordinary standard zoom lenses. Complicated mechanisms are built into this compact profile for excellent portability and ease of use. A complex triple-cam structure, where cams zoom and focus within a three-layer lens barrel, improves AF focus precision for close-up shots and control of torque when zooming. A comprehensive engineering overhaul has downsized its parts and increased their precision and durability, making the body lightweight and compact with a filter diameter of 67mm, overall length of 81.7mm (3.2”)*, and weight of 434g (15.3oz.)*. The lens achieves a minimum focus distance of 27 cm (10.6”) over the entire zoom range, the best in its class. The maximum magnification ratio of 1:4.5  at the 50mm setting is the top level in its class. Fast standard zoom lenses with an f/2.8 maximum aperture throughout the entire zoom range used exclusively for digital SLR cameras with APS-C sized image sensors. As of 15th December 2005. Based upon Tamron research of lenses in the same class. As APS-C sized image sensors are smaller than 35mm film, the 17-50mm can fill the frame with almost the same scope as a lens with a maximum magnification ratio of 1:3.0 on a 35mm SLR camera.